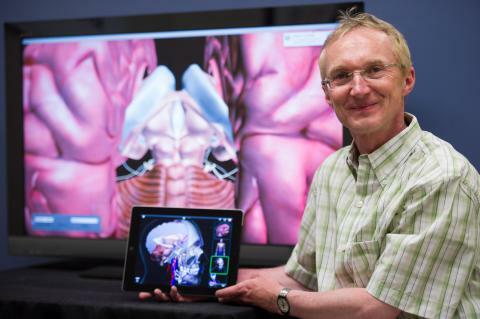 The LINDSAY Virtual Human project was introduced to an international audience on February 14 at the AAAS 2014 Annual Meeting during a symposium entitled “Virtual Humans: Helping Facilitate Breakthroughs in Medicine“. See the UToday story for some more details. Advances in computer hardware and software has made it possible to model the human system in silico, conduct virtual experiments, and validate these with in vitro/in vivo experiments. In addition to developing realistic simulations of the human, a new emerging field—systems medicine—is facilitating the integration of various “omics” along with detailed engineering and mathematical models of the human system. This, in turn, has allowed significant improvements in medical diagnosis and treatment. In this symposium, experts in computer graphics, engineering, and medicine discuss current state-of-the-art and future directions in computer-based modeling of humans at various levels of abstraction and how computational models and simulations are aiding new discoveries in medicine. Key topics covered are P4 Medicine (Personalized, Predictive, Preventive, Participatory), drug validations through a virtual liver, cardiovascular simulation models, advancing education through virtual human anatomy and physiology, neural disorders modeling and simulation, and physics-based models of hip injury. Here is a brief clip from a news report during the symposium.